The murti (idol) of Durga in Bengal during Durga Puja is sometimes flanked by Ganesh, Kartik (Murugan), Goddess Saraswati and Goddess Lakshmi. But what are these four important gods and goddesses in Hindu pantheon doing with Mahishasura Mardini during Durga Puja? 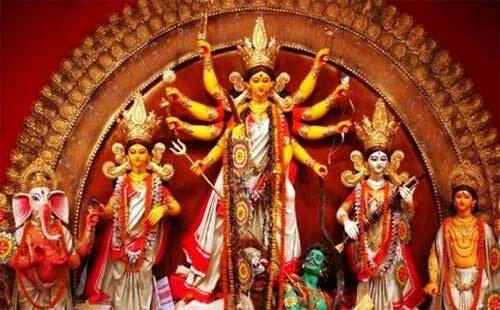 The popular story of Durga Puja and Navratri is that of Goddess Durga slaying demon Mahishasura. But in Bengal and in Eastern India, there is another story too and that is Goddess Durga along with her children coming to the earth to visit her parents. Confused?... Well, in Bengali story Goddess Durga is Uma or Sati the consort of Lord Shiva. Uma, also known as Sati, was the beautiful daughter of Daksha, the king of Himalayas, and Menaka. Uma was in love with Lord Shiva and she worshipped and prayed to him to make her his wife. Pleased with Uma’s devotion, Lord Shiva accepted to marry Uma or Sati. But Daksha was not ready to give her daughter to Lord Shiva who wore tiger skin and was bathed in ashes and roamed cemeteries. But an adamant Sati married Shiva. This angered Daksha and he waited for an opportunity to take revenge for this insult on Lord Shiva. Daksha soon arranged for a ‘yagna’ (pujas) and invited all the gods and goddesses but deliberately left out Shiva. Uma wanted to go to the yagna and ask her father how he could ignore Lord Shiva – the god of gods. But Shiva disagreed and warned her that she will be insulted by the egoistic Daksha. But Uma could not stand this insult to her husband and went to the ‘yagna.’ As foreseen by Lord Shiva, Daksha welcomed her with an array of insults mostly targeted at Shiva. Unable to bear the insults and coupled with the guilt feeling of not having listened to Lord Shiva, Uma jumped into the yagna fire and killed herself. (There are two versions some Puranas say she fasted to death other say she immolated herself). Lord Shiva who came to know this gruesome incident, immediately reached Daksha’s palace. A furious Shiva wrecked havoc and lifted the body of Uma and started dancing – the dance of destruction. The three worlds trembled and many foresaw an imminent end of the universe. The Devas approached Lord Vishnu and he suggested that the only way to pacify Shiva was by removing the body of Uma. For this Lord Vishnu cut the body of Uma with Chakra and it fell in different parts of the world and these places were known as Shakti Peethas – two important shakti peethas are in Kalighat in Kolkata and Kamakhya in Guwahati. This pacified Lord Shiva. Daksha was forgiven by Lord Shiva and Uma was later born as Parvati. Since peace was restored, it is believed that during Durga Puja in Ashwin month, Uma, with her children, Ganesh and Kartik and along with Goddess Saraswati and Goddess Lakshmi visits her parent’s home. Two friends or 'sakhis' of Uma – Jaya and Vijaya also accompany Uma.